Guests of The Homestead have exclusive use of the Mountain Flowers Par 3, nine-hole golf course that is nestled in the center of the resort. Your game begins at the pro shop in The Village near Little Belle, one of our quaint resort hotels. 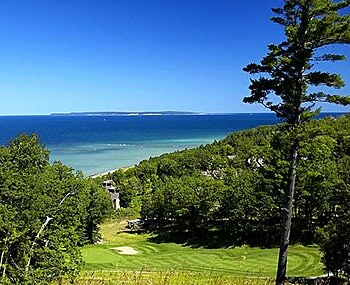 Work your way up and down the dune elevations and tee off with Lake Michigan, the Manitou Islands and the Sleeping Bear Dunes as your backdrop. The spectacular views will take your breath away while the course challenges your ability.